At this time, joint official forces —our central colonial government, FEMA and the military— are making big mistakes that are making things even more difficult for individuals and for organizations, as well as municipal governments. In part, they are making mistakes, because they are forcing a collaboration that is not appropriate and not equitable for Puerto Rico. As so many in social networks have pointed out, the US should help Puerto Rico, because that is the right thing to do, NOT because we are US citizens! Therefore, one of the first things we need to do is to convey a clear and strong MESSAGE: Our people should NOT have to plead and beg the US for help. We deserve help from any country that is in position to aid us. It must be clearly understood by anyone helping our people: We are a colony of the US. 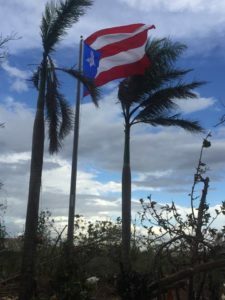 The US government and Wall Street are responsible for the historic pattern of disempowerment of Puerto Rico’s people, of our fiscal crisis and of the ensuring and grave structural problems, not to mention our deep internalized racial and colonial oppression requiring multi-generational ontological repair. Today, Puerto Rico’s colonial collaborators are using this natural disaster to advance their unnatural agendas. We, at Colectivo Ilé, will continue, together with other organizations, collaborating and gathering information on what the needs of our people are, now and a for the foreseeable future. Yes, the Island is devastated. Yes, we need water. Yes, some need food. Yes, we also need gasoline (unfortunately, for now). Yes, there are communities still isolated. Yes, we all have lost much. And we will continue to hear terrible stories that move our hearts and stretch our humanity to the max. But hear this: We, the Puerto Rican NATION, and the many people and groups at the grassroots level, will continue to grow stronger! Unlike our government, which will continue to be al garete — lost at sea. farmers leading the way to generate food sovereignty and sustainable agriculture. social activists working on comedores sociales (social eateries) making sure people needing a meal can get some food in their stomachs, including university students. environmentalists who have been at the forefront of protecting the Island from developers and speculators. women’s groups with a womanist perspective. artists who have devoted themselves to awakening critical consciousness throughout the Island. people that are working diligently to lessen our dependency on fossil fuels. Now as in the past, our government seems intent on maintaining the people’s sense of dependency on the US. To that end, they will need for all of us to continue to buy into the notion that we are just too tiny island, and just too weak a people to survive on our own, free from US tutelage. Please, help consciously and give generously and be statregic.